1. 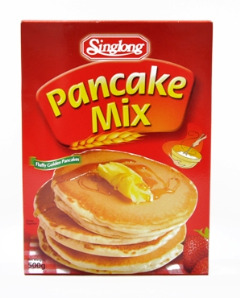 Mix Singlong Pancake Mix with cold water and stir well. You can add in thinly slice bananas for Banana Pancakes or grated orange peel for Orange Pancakes. 2. Heat up sauce-pan and grease with butter. 3. Pour 1/4 Cup butter in and let it spread in round shape. 4. Cook both side until golden brown. 5. Serve warm topped with a piece of butter and honey as you prefer.